This thread is dedicated to the heater method by Rosemary Ainslie. I hope to see some replication attempts. the duty cycle and frequency. Download ALL the docs and read through them first. It would be good to find a way to change the measuring of temperature to something involving potential or current since that would be easier to measure and most of us has a meter for it. In this particular circuit, the heat amount appears to be absolutely disconnected from the current or voltage so measuring the heat and converting that to an equivalent amount of "electricity" is probably the only honest way to do it. The "rules" seem to be the same in most "overunity" systems. This is just an idea, don't know how it play out but perhaps the heat can heat x volume of water from x degrees to y degrees hot. It is known how much energy in joules must be expended to raise a certain volume of water from one temp to a certain temp. Then a thermometer can just be sitting in the water. OK, Here is an explanation of the schematic diagram above, for the creation of an Electric Heater with a COP>20. PS = the Power Supply. This is the Primary Supply of energy to the circuit. Any NEW ENERGY required to run the circuit must come from here. It can be a battery, or any source of DC current. RL = the heating element (load) that has the electrical characteristics of both resistance and inductance. Electrically, the component is operated as an INDUCTOR to be charged and discharged in sequence. C = a Capacitor of sufficient capacitance to act as a secondary power supply to power the circuit and to act as a reservoir to receive the energy returned by the inductive collapse of RL. D1 = a Diode to make sure that energy can only move in one direction, in this case, FROM the power supply TO the capacitor. This component prevents any of the energy returning from the inductive collapse from traveling all the way back to the primary power supply. So, in operation, this Diode will allow the Capacitor C to rise to a voltage that is higher than PS, but it will never allow C to drop to a voltage below PS. SHUNT1 = a low value, calibrated resistor used to measure the currents leaving the Power Supply PS. Current pulses measured here, times the voltage of PS, represent ALL of the energy the circuit is "dissipating". Q1 = a Power MOSFET, or any appropriate switching device to allow currents to magnetize the inductive load RL. This includes all of the timing circuitry for the circuit's proper function. D2 = a Diode to complement Q1, to allow currents from C to energize the load RL. D3 + D4 = Diodes to direct the energy of the inductive collapse of RL back to Capacitor C so this energy may be re-used. SHUNT2 = a low value, calibrated resistor used to measure the currents supplied from C (through Q1 and D2) to the load RL. Current pulses measured here, times the voltage of the Capacitor C, represent ALL of the energy supplied to the load RL. The circuit is designed to operate in the following manner. Q1 is timed to produce current pulses which magnetize RL and then shut off, based on the inductive "current rise-time" of the component. The exact timing of this depends on the inductance of RL and the voltage of the Power Supply. RL then discharges as an inductor through Diodes D3 and D4 back to Capacitor C. This represents "one cycle" of the circuit. As soon as this cycle is completed, the process repeats. RL is meant to be a Resistor Element made of NiChrome Wire, wrapped in a spiral shape around a ceramic frame, as pictured above. Every time there is both voltage and current present at RL, heat is produced. This includes both when currents are being supplied by Capacitor C and when currents are being returned to Capacitor C. Since the inductance of RL does not change during this charge and discharge cycle, the total amount of energy capable of being recovered from the inductive collapse should be on the order of 95% of the amount of energy supplied, during each cycle. In this situation, currents can be supplied to RL and returned to C rapidly, with very little "real energy" lost to the circuit. Any energy that is actually dissipated, such as voltage drops on the switching devices (Q1, D2, D3, and D4), will be made up for by energy provided by the Primary Power Supply PS. 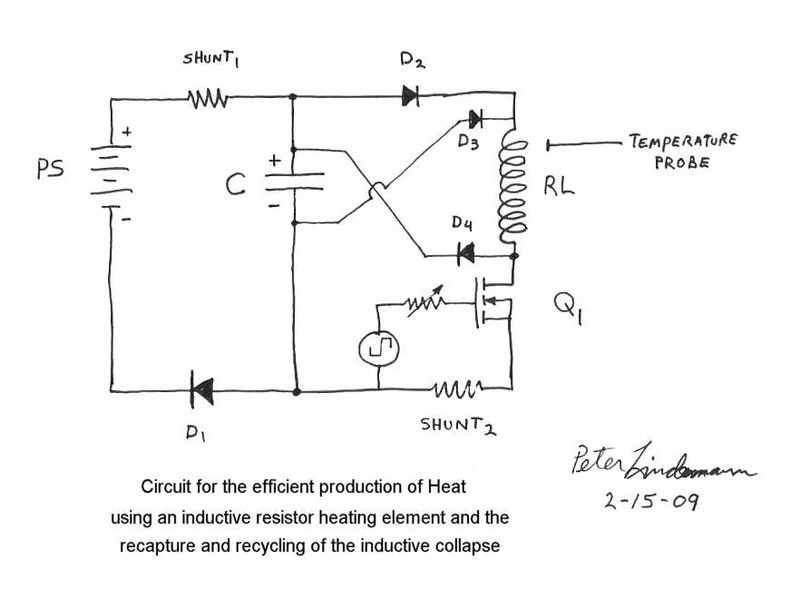 This "schematic" is provided without specific values, and is meant to provide a theoretical basis for understanding how an Electric Heater with a COP>20 could work. Last edited by Peter Lindemann; 06-02-2009 at 05:10 PM. This Is The Best There Is! I am going to take this opportunity to propose as to leave ALL threads free of doubts with different peoples views on all subjects and all threads, a new thread, just to air, all topics what ever, and keep active constructural threads free. This is something that I have been thinking of for some time, lets call it THE AIRING THREAD, for a better name, I will start it now. It sounds like your heat exchangers are fantastic. The idea of a COP>20 is based on being able to "recycle" 95% of the electricity in the circuit. This is feasible when the inductance is constant, which it is in this case, and operating voltages are above 60 volts. Rosemary Ainslie's original circuit produced COP>17 in actual tests. If you haven't already read the documents linked at my site, please do. In the Electric Motor Secrets thread, I showed how to produce mechanical energy while recycling the electricity. In the thread with Imhotep, we showed how to light fluorescent lights while recycling the electricity. Now, here, I am showing Rosemary Ainslie's method to produce heat while recycling the electricity. This completes the "GENERAL CASE" of how to use electricity efficiently, first described by Nikola Tesla, and referred to by Gabriel Kron as "shuttle circuits". The real method to produce Heat, Light, and Motive Power, at efficiencies above the supposed limits described by the Laws of Thermodynamics, is now fully in the Public Domain. Last edited by Peter Lindemann; 06-02-2009 at 05:08 PM. If this does come up to spec: we could make a heat engine which would only need a start up input and after would run on its output with considerable excess energy. Last edited by Michael John Nunnerley; 06-03-2009 at 02:58 PM. I do not agree with your previous post and do not wish to comment on it here. Please feel free to remove all parts of Post #7 that are "off topic" and start a different thread. This thread is about Rosemary Ainslie's astonishing contributions to Science, and related developments. What I will use initially. Take a look at the following link and comments are welcome. I am now using this method to test the excess heat. At the end of the day I will add some comment and RL specs. I think this will be a little better arrangement than open air testing. Last edited by SkyWatcher; 06-03-2009 at 06:06 AM. Hi folks, ran some tests that I thought some might find useful. I used the circuit shown in the pdf where the title is " Counter electromotive force enables overunity results in electric systems" from Peter L. website. except instead of a mosfet I used an npn tans. with a diode across emitter/collector. I also used an inductor from a high end car audio cross over network with a 200 milliohm resistance in series with a 1 ohm 10 watt wire wound resistor with copper coil inside. well i assume its copper i opened one up and it looks like copper to me and has no attraction to a neo magnet. and it was pulsed with a 555 timer @ 650 Hz. and a 32% duty cycle. I ran a few tests and found that the voltage when running the tests without the flyback diode connected to the positive of battery/resistor leg dropped the battery voltage much quicker, but when the flyback diode is connected it holds a higher voltage and recovers its unloaded voltage better also, so its definitely getting positive feedback. Then i ran a crude finger test holding the bottom of the resistor with my thumb and timed how fast it takes to heat the resistor till it becomes to hot for my thumb to touch. after 3 tests without the fly back diode output attached to positive leg it took about 46 seconds before i had to remove my thumb and of course with identical cooling periods in between. Then i ran 3 tests with the flyback diode connected and it took 25 seconds to reach the same temperature where my thumb cant stand to touch the resistor any longer and with identical cooling periods in between, that is about 54% less time needed to reach the same temperature. So it appears that this setup is not only feeding energy back to the battery but also is increasing the heat output in the resistor and over time and using a calorimeter would confirm Rosemary Ainslie's results. Im sorry 46% less time needed. Thanks for that quick "rule of thumb" test. It looks like all of the basic behaviors showed up in your test; that is, almost twice the heat AND some portion of the electricity conserved. Thanks for sharing your little test. I hope this encourages other experimenters to look seriously at this discovery, and do some well instrumented tests. Great test, thanks for posting the results, certainly looks very promising!! Could you tell me if a function genny. could be used instead of a 555? I rarely, post..... and Personally im no motor builder, but I think something is being missed by most on this thread. I have read several people ask about generators, however the motor in its present incarnation is not all it could be, this is most likely to get the home experimenter comfortable with the basics before moving on. Take for example an AC generator, with field windings, and permanent magnets on the rotor. The field windings could easily be wound into an LC circuit making the motor supposedly run on reactive power. However, what is not immediately obvious is that the rotation of the rotor will impart upon the filed windings an EMF from the magnets directly related to its rotational speed and the number of poles on the rotor. This counter emf per lenz law will create a frequency within the LC at varying speeds (depending on rev-up, down, loading, etc) which will not match its resonant frequency, hence hindering the resonant rise, Q, and overal efficiency of the motor. However if you had a lenz less motor, the result would be a rotation caused by the driving circuit independent of a generated EMF due to the rotation of the rotor. Such a motor could be run by a resonant circuit, returning all power given to it back to the source, in this case, the source might locally constitute a capacitor with an impedance matching the drive coils for a particular frequency. This tank circuit would be allowed to oscillate freely, without having to worry about any stray emf frequencies created by the rotor. This cannot be easily applied in its present form to the current motor as it stands. The rotation of the current model is dependent on the position of the rotor with respect to the pole projections of the stator. This means that frequency of operation within the drive coils is dependent on rotor speed, meaning it too is tied down to rev-ups, downs, variable loading etc. In order to reach a reactive state at a particular frequency, the rotor would have to spin at a very specific speed. Also noted, is that the inductive properties of this motor change constantly! which is terrible for such a design. Hence the fact that it is a variable reluctance motor. This property too is detrimental to reactive conditions. BUT! it has one of the problems solved, and clever geometries and tricks can solve other problems. Such as reactive rotors (Tesla has patented them) constant reluctance rotors (would need a simulated rotating field, where poles switch at a phase less than 180 degrees) and other ideas come to mind. What you were all given is gold, but it is far from where it could be, and I get a sneaking suspicion that the only thing that is holding Dr Lindeman back from advancing ideas publicly at this point is the overall comprehension, i.e. no point in leaving people behind at this point. Get clever with similar concepts and you can apply it all to solid state as well, leaving behind the need for kinetic power supplies. And thank you Dr. Lindeman for your work teaching, and taking the time help people out. I have given you an unfair shake in the past. Thank you for your kind and insightful remarks. With regard to your post about the Jim Murray Generator design, I have known Jim Murray for 20 years and we published this patent in Borderland Magazine back in the 1980's. All of the people I worked with in Santa Barbara, including Mike Knox, Eric Dollard, and Chris Carson, met with Jim Murray a number of times after I moved away in 1992. Jim and Eric subsequently solved the solid-state method for converting reactive power back to real power using Jim's methods applied to Eric's FOUR QUADRANT THEORY of electric waves. All of these things you mention have already been accomplished. While Jim has built working models of this generator, getting all of the electrical and physical resonances in phase is tricky. The machine does NOT exhibit drag free operation until these conditions are all balanced and synchronized. Still and all, it does PROVE that electric motors and generators are NOT converting mechanical energy into electrical energy. The First Law of Thermodynamics does not apply to properly built motors and generators. For those of us who know the truth, this is not a problem. As you have correctly stated, there is little purpose showing more precise theory in a forum like this when the model building difficulty only gets worse than what has already been shown. I will tell you plainly, however, that the CONSTANT RELUCTANCE MOTOR is the ticket and special geometries are the method of accomplishment. When the reluctance does not change at all during the power stroke, then the inductance of the circuit remains relatively constant as well. This allows for the design of a true, constant speed, synchronous motor that produces maximum mechanical power on 95% reactive power and about 5% real power. This allows a COP=20 operation as technically feasible. For those who are interested, here is a link to a rare film of Jim Murray speaking on the history of his work. Most of the concepts are quite beyond the beginner level, and the cinematography is D-, but the information is A+++. I am very surprised nobody posted this sooner. This is a good starting spot, however you can do away with many diodes, along with allowing the resistive element to be separated from the inductive element resulting in greater amp draw in shorter time periods. (ie reducing the L/R time constant) which will result in an increase in energy output vs time. In such a scheme, the inductor charges at a low resistance, and discharges at a high resistance. Proportions are important. It is harder to see how increase in frequency literally translates to an increase in energy, however circuits such as these make it very apparent. Here again it is stated that keeping inductance's stable (capacitance's as well) is important otherwise you will experience bifurcations of the oscillatory currents. Unless you are injecting energy directly into the system parametrically through this method (in which case exact frequency is important), it is generally detrimental. This applies to all forms of transducers in this category. What you have been shown is essentially half of what is needed in order to have complete the energy cycle ending in the same form of power out you put in. i.e electrical - electrical, or mechanical to mechanical. Im actually kind of disappointed Dr. Lindeman had to point out the similarities, its more fun when the cat lets itself out of the bag. and people connect the dots on their own, but its all good. Hi folks, It was my pleasure Peter L. doing these simple tests. Hi Petersone, I do not have a signal generator although I remember seeing a video where it had square wave output and sine output, so I would imagine if you only have sine output just put one diode on the output to create dc pulses. I have been thinking about the resonance motor for quite a while. Maybe it would be worthwhile to start a new thread on that. But to stay on topic here, could you expand a little bit on the effects of the L/R ratios in resonant circuits (why capacitance reduces Q). We're not working in resonance mode here, so I suppose that a higher switching frequency would give higher benefits than an optimised L/R ratio. Alright, one more free post before I start collecting manditory donations. All of this can information can be found by review of basic electrical principles, and correlating them. All interactions between inductance and capacitance (or other inverse conditions) have their energy "transformation" characteristics governed by certain predictable correlations. All this complicated talk basically comes down to time constants, and knowing how resistance affects a system. A high resistance in an inductor means a quicker time constant, meaning it reaches its maximum current more quickly. This is because its maximum current (at a given potential) is lowered by the high resistance, so the current reaches its "cealing" faster. A low resistance coil has a larger time constant, taking more time to reach maximum, however maximum is much higher. If you look at the equation for energy in an inductor.... energy = 0.5L x I^2, you see that as current doubles, energy in the inductor increases by a factor of 4.
basically all im saying is that you want conditions favorable for getting high current, in a quick time, this equates to low resistance coils. However when an inductance collapses, its speed of collapse is dictated by the impedance of what it is collapsing into, this can be the impedance of a capacitor, or a resistive element. The higher the impedance, the quicker the collapse. No energy is lost if you have a high impedance (heating element?) being driven by the collapse of an inductor, simply the speed at which the collapse happens is changed. The fulcrum of this change is the impedance, dictating how fast in simple relations anybody can look up. As you can see, low resistance in charging an inductor is favorable, and a resistance on its discharge becomes a "fulcrum" dictating the voltage rise from the inductor. In an LC circuit, you cannot have this, You cannot have high resistance, then low resistance, you have either one or the other. And you have polarity reversals, which can be problematic in other systems. But if you could somehow develop a "one way tank circuit" as this circuit shows, then you can have your cake and eat it too. This is an incredibly simple addition to the "boost converter", and can be used to drive any inductively or capacitively stable load. Just dont discharge back into a battery, this is a waste of energy, capacitive elements are much more efficient. Study up on impedance matching, and other related topics. I wonder how many people would have realized they had ou if then knew about impedance matching. 3v at 5000 amps is alot of power, but you might never know it. Last edited by Armagdn03; 06-04-2009 at 04:53 AM. Uploaded a pic of temp measurement with heating wire I think is similar to that described by SkyWatcher. I scrounged it out of a 12v heated auto coffee mug from the dollar store. Temp is reading 10 degrees above ambient and neon is lit. (Not much I know but give me a break I'm engineering my no-budget prototype out of garbage.) Parts list: Transformer, one 1n4007 diode, small 6v dc motor turning maker breaker disk, neon bulb, 12v battery, wire. Check out the links to this patent's many interesting citations. Energy conversion system - Google Patents - The Tesla Turbine of my dreams again! integrity during the off period of the duty cycle. Its voltage tolerance also restricts the range of applications that could otherwise be immediately applied. Perhaps these patents have a clue leading to the overcoming of this restriction. I'm figuring Rosemary Ainslie's observations and math are valid and would like to see where it could lead if we take the liberty of making some assumptions based on them. Many circuits have been evaluated with varying levels of benefit but all circuits have measured gains that exceed unity. These circuits include, for example, the use of single and double wound inductors to induce counter electromotive force. N FETS or P FETS can be applied. The flyback diode has also been variously applied to the same battery or to alternate batteries connected to the supply by a common negative rail. This, in turn results in a recharge of that battery without compromising the energy delivered to the resistor in series with the supply. Tests have also been conducted from alternating current supply sources using step down transformers. Frequencies can be varied but it is evident that the faster the frequency the better the return. Would love to see a list and comparison of the "many circuits" evaluated that all had "measured gains that exceed unity." Was also hoping maybe some of the Tesla Switchers on the board would comment. The fundamental laws of physics, as they relate to the transfer of electric energy, have been effectively used. Applications of these have pioneered our most advanced technologies and these are, indeed considerable. Because of the remarkable success in this field, it is widely understood that everything that can be known about electric energy transfer and application, is known. Therefore there has been no need to revisit those principles established by the Laws of Induction. And, consequently also there has been no need to question the Second Law of Thermodynamics. As a result, there are no engineering publications available for citation. It is hoped that this lack will obviate the need for references in this submission. Self-induction.—This term signifies the property of an electric current by virtue of which it tends to resist any change of value. Self-induction is sometimes spoken of as electromagnetic inertia, and is analogous to the mechanical inertia of matter. It is on account of self-induction of the induced currents in the armature winding of a dynamo, that sparks appear at the brushes when the latter are not properly adjusted, hence the importance of clearly understanding the nature of this peculiar property of the current. Maybe I'm way off base here but I've staring Rosemary Ainslie's patent since it hit this board and that's what I'm seeing. As for the direction I'm headed...Can you say "METADYNE"? Thanks to all for all they've done and keep up the good work. Maybe the Moment of your Pulse is importend too, timing even, but looks like, the Size of the Capacitor can make a different too. Last edited by Joit; 06-04-2009 at 10:22 AM. My fuction genny has a square wave output,but I don't think I can change the duty cycle,only 50/50,I think. Thank you Peter for directing to a source so close to Teslas work. I have fetched some other videos with Jim Murray, but the link above has no contents in the google videos, just the headline. I will be thankful if someone has a copy, so I can access the video, please. Thanks for the "scratch", that was highly appreciated. Excuse my late reply, my work comes in the way of my hobbies. All things are still not clear for me but I'm working on it. I have found your posts on the Resonance thread and will devote the time to really get a good understanding. As a particular resonance frequency can be attained with a wide choice of L/R ratios, is there a particular ratio that would theoretically be more hmmm, <efficient>? Or is it just that a particular value of L, or C, is always chosen in relation to what's available, or what's most practical in the circuit being designed ? Last edited by Altair; 06-04-2009 at 05:55 PM. The device can be called a regenerative boost converter or a one way tank circuit, and is of one of my origional designs, (please do not use for monetary gain, you will hear from me, lol) I will not provide a schematic, because its easier to envision its opperation mentally. A battery charges an inductor to near near its limit, per the inductive time constant rules. This inductor is of very low resistance, I have a 1 ohm 10mh coil. I have a small sense coil placed near it. When the inductor reaches maximum, its ability to induce on the sense coil reduces to zero. when it reaches zero, the sense coil turns the switch off untill conditions are right to turn it on again. In this way, even as conditions change that affect the charge discharge cycles, the switch is controlled by the inductor reaching a current limit. In this system, the inductor has maximum current rise due to the high conductivity of the input section. The output of the inductor is high impedance (not too high) or high resistance. There are also ways to do this with NO diodes, and only one or no switching devices. This gets into theory a bit advanced for thsese forums, but perhaps this will get a few thinking. From this point, a person could actually begin to re-write the physical laws using the mathematics no higher than trigonometry. Before this was impossible, now it is easy. Entropy has to have its inverse brother, completing its unit circle relationship. If anybody is interested, I have a few small demos on youtube under the username Tortuga0303, these give a few jumping off points for understanding electrical embodiements of oscillation. Last edited by Armagdn03; 06-04-2009 at 07:28 PM. I think the best duty cycle for this kind of circuit need to be experimented. On my experiment of coil collapse current circuit, 10% ON at 2KHz is a lot cooler than 50% at 50Hz. Cool enough to let it run 8 hour a day for few month at 0.4Amp. I think there should be sweet spot frequency or duty cycle for heat generation too.